When I say 101 maybe I should say more like -101…I believe this is where my green thumb is still learning in many many ways. For whatever reason I have probably killed more succulents than I currently have living. It’s a sad thing. I could tell stories for hours about my adventures with owning succulents. First I thought I was not watering them enough (big mistake) and I rotted their roots, then I thought they were too hot and brought them inside in the air conditioning (big mistake) they hated me and shriveled up. Finally now I feel like I am starting to figure out they want want very little of me and I need to care very little about them other than a few little things, which I am still not sure if I am doing right because right now my pot looks a little sadder than it does here…So today I thought I would share a few things I have learned and maybe you all can fill in the blanks cause I am sure one of you HAS to have succulent knowledge and success, right?! I have always known that succulents are desert plants and hold their water in their leaves rather than their roots and so I have been trying to approach my thoughts on growing them similar to how they grow in the desert. First I moved them into a container that had good drainage (I highly suggest a terra-cotta pot if you have one). In mine I pocked tons of holes by using a nail and hammer to cut through the metal. I then filled the base with stones (yeah it makes it heavy but if you think about their soil it is important to have good filtration in the soil). Next I filled the rest with succulent and cacti dirt that does not hold moisture. 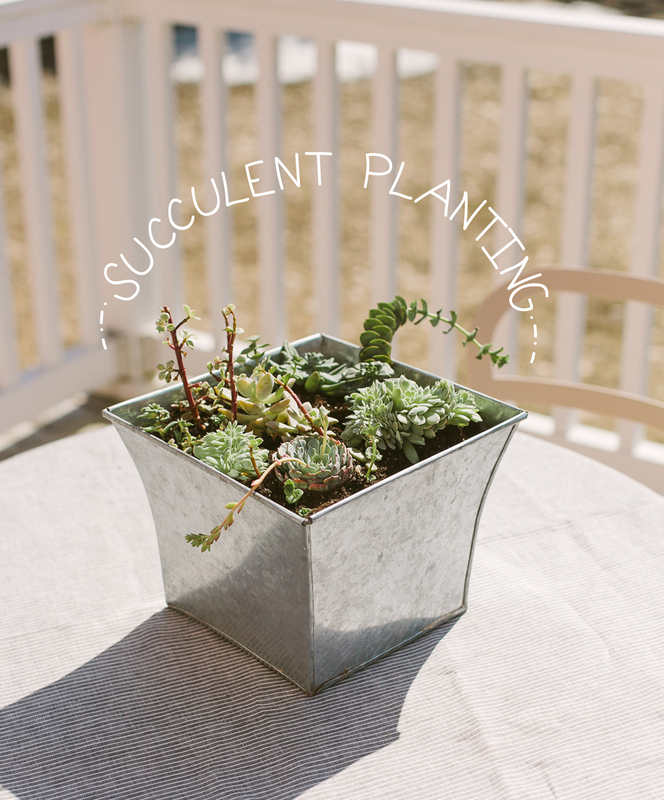 I have had success with this in the past with other individually planted succulents. Once I have the pot ready I just dig holes and place them in the pot as I want them. Pretty simple! It is the maintenance and protection of them that you must watch out for especially in cooler climates like Northern Michigan. My big thing is I try to divide and replant every season. There is always new growth and sometimes it is best to separate the new babies to start new pots. To do this all you have to do is clip the from the main plant and place the base on the dirt. In about 2-4 weeks it will have created roots and creating it’s own plant. This helps to help the main plant to continue to grow strong and also to give you more plants, which who can say no to a baby succulent sprout? Not this girl. After my incident of over watering and as Mike calls it “over-nurturing” my succulents in the past, I began using the misting method where I spriz them in the morning (if it did not rain or dew that night) and then in the evening before it gets dark. This I think has helped a lot especially during the Summer months when it is very warm. They love the sun but they also need the dew and water that the desert naturally supplies in the cooler times of the day. I’m a sucker for succulents and love them! Mine are so forgiving that I’ve never felt the need to learn more about taking care of them. So I’m not of great help here 😉 I simply replant the “leaves” (well I just stick them into the ground) and they continue a life on their own. Looking forward to reading more experts advice here as I’m sure there is a lot to learn! I recently joined the succulent fan club and got two little ones. Maybe it’s the Boston winter we had (which finally just left) but I’m in the same boat. Some of the leaves wilt and curl up black one week, but are full the next. I planted them in cacti/succulent soil and they get about a half day’s worth of sunlight from their window sill. In a last ditch effort to not see the poor things unhappy I bought some succulent food at my local hardware store. Not sure it will work, but I feel better, at least. Living in a cool and damp climate like Oregon, it’s the lack of sun that makes it difficult. I thought growing succulents inside would make a difference, until I realized the issue wasn’t the climate – it was me. I’m guilty of over-watering, neglecting and over caring all at once. Pretty much giving my plants (as in all things green and growing) little to no chance of survival. I like your approach…..misting them in the morning and at night. Think I’ll start there! Thanks for keeping it simple and approachable as always! They’re so cute! 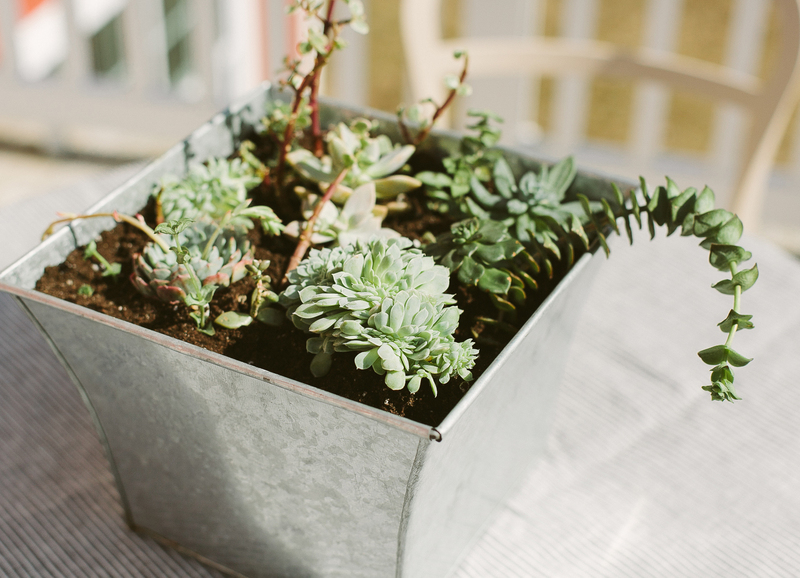 I am getting ready to start sprucing up my deck and might give some succulents a try. 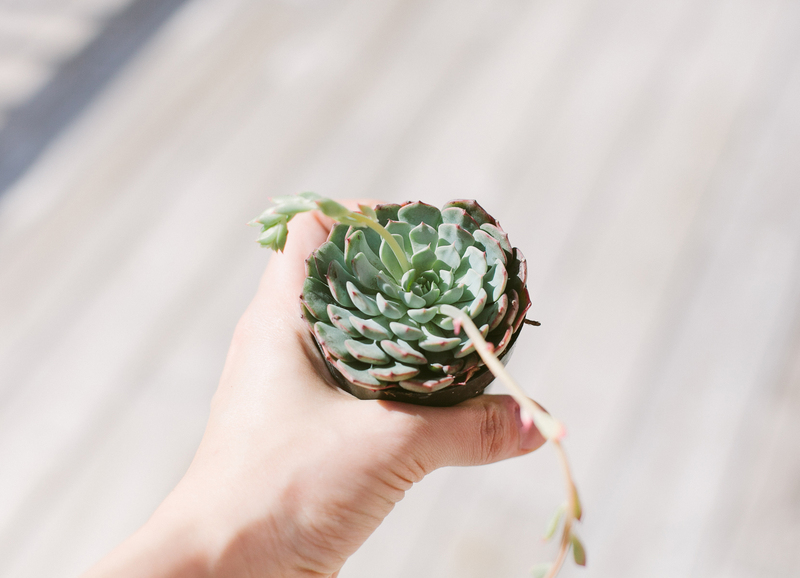 So glad I came across this post – I recently planted a bunch of succulents and fear I may have been overwatering. Going to try the misting technique in the mornings and evenings – thanks for the tip!! You gave me the freedom I needed to bring them inside during 30 below days.